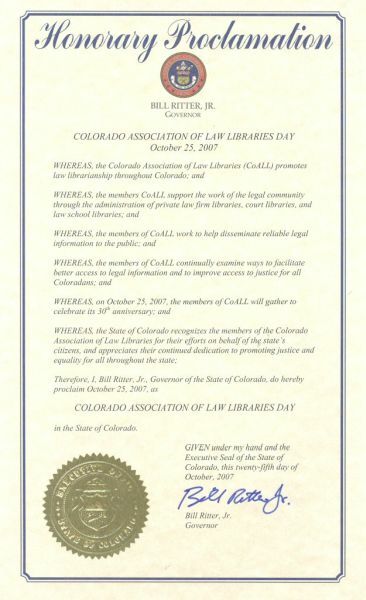 The Colorado Association of Law Libraries (CoALL) exists to promote law librarianship through various professional education and networking opportunities and to promote the organizational value that law librarians provide to the many different stakeholders throughout the legal community. Launched in 1977 as the Colorado Consortium of Law Libraries, in 1984 the organization petitioned and was granted official chapter status by the American American Association of Law Libraries (AALL). Rebranding itself as the Colorado Association of Law Libraries , CoALL members continued their mission to create value and demonstrate the important role that law librarians play in the legal profession. 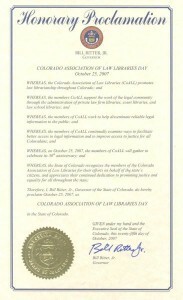 October 25, 2007 witnessed CoALL celebrating its 30th Anniversary of serving the community with this accomplishment receiving official recognition by Governor Ritter who proclaimed it Colorado Association of Law Libraries Day. On April 25th, 2002, the President Druet Cameron Klugh named Justice Gregory J. Hobbs, Jr. an honorary member of the Colorado Association of Law Libraries. Justice Hobbs is the only individual on whom CoALL has conferred this title. Click Here to read a transcript of the Keynote Speech Justice Hobbs delivered at CoALL’s Annual Institute for Law Librarians and Friends on February 24th, 2001 at University of Denver School of Law. Click Here to read the article “Justice Gregory J. Hobbs, Jr. – A Man for All Seasons”, published in The Colorado Lawyer in 2015 on the occasion of Justice Hobb’s retirement from the Colorado Supreme Court after nineteen years of service.